Greenleaf Book Group Press, 9781626343887, 248pp. Having worked his way up from sales rep, to sales manager, to general manager, author Kevin F. Davis understands the particular challenges faced during the transition from sales to managing salespeople, and the transition from managing sales reps to managing managers. As president of TopLine Leadership Inc., which he founded in 1989, Kevin offers customizable sales and sales management training programs that provide sales managers with the essential skills and knowledge they need to become great at what they do and help firms dramatically increase top line revenue growth. Over the last three decades, he has delivered sales and management/leadership training to tens of thousands of tenured salespeople and sales managers. 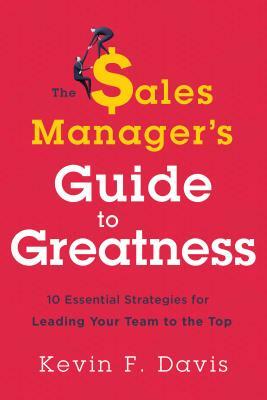 Kevin's most recent book is The Sales Manager's Guide to Greatness: 10 Essential Strategies for Leading Your Team to the Top. He has also authored two sales books: Slow Down, Sell Faster! and Getting into Your Customer's Head.